This beautiful cast-brass tea pot has a slender, flattened, oval body – a form known as satrandsh and most associated with Kokand. The body and neck are finely engraved with a geometric network of interlaced floral scrolls very much in the Timurid tradition. Raised almond-shaped cartouches are on either side of the body. 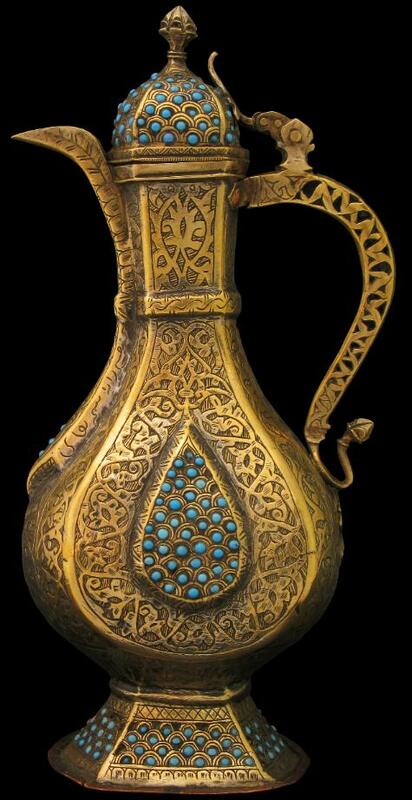 The tea pot is studded on the body, flared foot, lid and lower neck with turquoise-coloured cabochons. The openwork handle terminates with a delicately-cast lotus bud as does the lid, betraying the tea pot’s Silk Road origins. The lotus theme continues with lotus petals engraved to the underside of the body, rising from the base. hijra (AD 1810). This date is in keeping with the dating suggested by Kalter (1997) of similar extant tea pots which he ascribes to the late 18th and early 19th centuries. The turquoise cabochons are inset into the body and held in place using asphalt as an adhesive, which is typical of Bukharan inlay work. There are losses here and there to the turquoise, but generally most are intact. The foot is covered on the underside with a beaten silvered copper sheet. Kalter, J. (ed. ), Uzbekistan: Heirs to the Silk Road, Thames & Hudson, 1997.